Around 70 demonstrators marched through the capital this afternoon. ‘YELLOW VEST’ PROTESTERS attempted to block traffic for around an hour in Dublin this afternoon as part of the latest weekly demonstration by the group. Around 70 demonstrators gathered outside the Department of Housing on Customs House Quay at around 2pm, when they were greeted by a small number of ‘anti-fascist’ protesters. The protest subsequently made its way along the south quays towards Dublin Port and eventually stopped near the southbound entrance of the Port Tunnel. Approximately 30 protesters sat down at a roundabout, where they unsuccessfully attempted to block traffic. A list of demands was also read out by protesters, including calls for citizen-initiated referendums, a ban on all evictions, and the resignations of Taoiseach Leo Varadkar and Minister for Health Simon Harris. Other demands included the legalisation of medicinal cannabis, the abolition of the television licence, and a ban on TDs from becoming landlords. Members of the group held a wide range of views, including anger at banks, corruption, and the previous government’s austerity policies. Some of the protesters spoke in opposition at Ireland’s immigration policies and against mass migration in general. A smaller number expressed opposition to this stance, saying that they were marching in solidarity with ‘Yellow Vest’ protesters in France and held different views to those put forward by a number of speakers at the demonstration. Small protests also took place in Wexford, Waterford and Galway, where similar lists of demands were read out by demonstrators. With reporting from Cormac Fitzgerald. 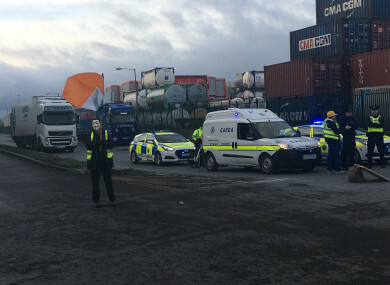 Email “'Yellow Vest' protesters attempt to block traffic near Port Tunnel in Dublin”. Feedback on “'Yellow Vest' protesters attempt to block traffic near Port Tunnel in Dublin”.